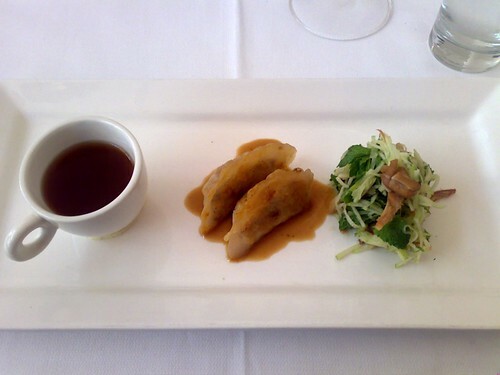 We're back at Wildflower and opting to try their 7 course degustation for lunch! 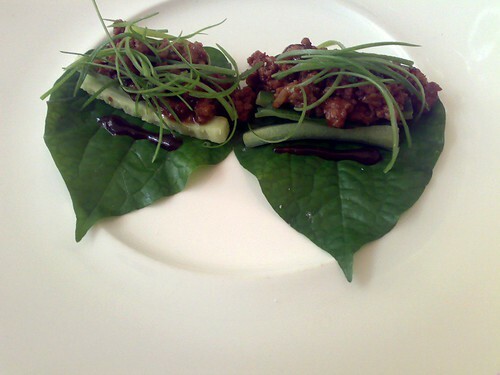 A twist on San Choi Boa - Seared Lamb with Hoisin, cucumber slivers and spring onions served on Betel Leaves. It's fresh with a wonderful sweetness from the Hoisin. An excellent start. 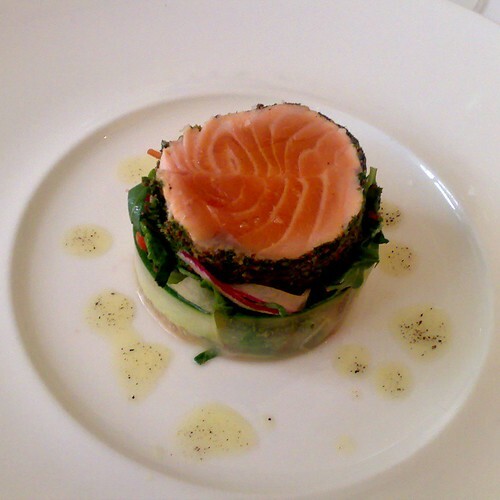 Poached salmon still rare in the middle sitting on a light salad of shaved cucumber and micro greens. 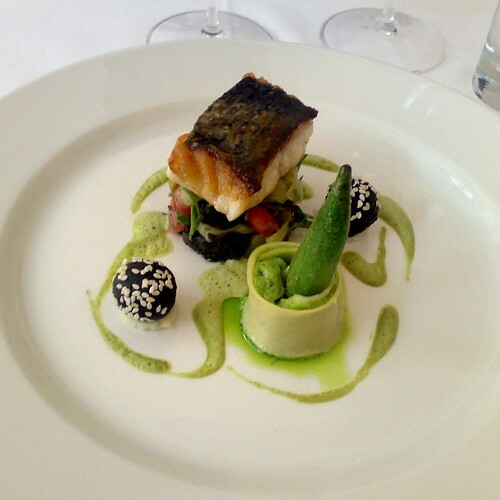 Black bread balls - pasta with okra - fattoush sitting under a seared piece of barramundi. 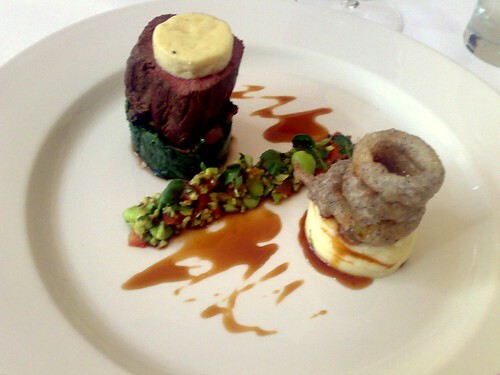 Seared Eye fillet on spinach with onion rings and mash potato - salad of broad beans and other legumes. 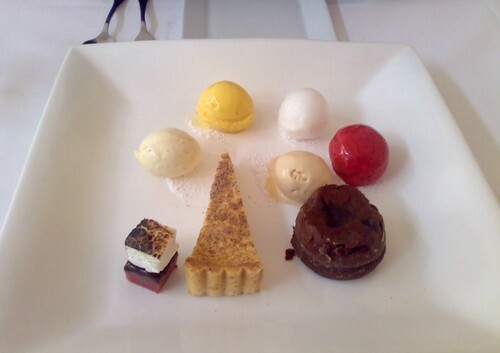 A shared platter for dessert - from bottom left - turkish delight topped with marshmallow, vanilla bean ice cream, mango sorbet, coconut ice cream, raspberry sorbet, dulce de latte ice cream, hot chocolate cake with oozing centre and malt custard tart. Oh My God! Great mouthwatering pictures! I can't wait to visit Melbourne! I've saved your site to my favourites for reference if I ever visit Australia. Thanks Sig - I hope you get a chance to visit! I had a recent visit to Wildflower and it all seemed so familiar. Now I know why, I'd previously read your wonderful review! I was really surprised and impressed by their fare. Hi Truffle - your meal looked great - I would love to have tried those soft shell crabs.